How would you like to find a solution for poor dental alignment that will not require metal braces? For many patients, Invisalign aligners have served as an effective remedy for gaps and overlaps between teeth that have hurt their appearance. Rather than go through a period with metal braces correcting your smile, you can rely on discreet, removable clear appliances to help you change your appearance for the better. Your Lafayette, LA dentist’s office can talk with you about this procedure, or other treatment options that can give you desired smile improvements. What Can You Look Forward To During Your Invisalign Treatment? Your experience with Invisalign can be a positive one, as you will have the freedom to remove your orthodontic appliances, and the comfort of knowing that they have little effect on how you look. Image-conscious teenagers and adults in professional workplaces can be relieved to know that a discreet alternative to metal braces is available to them. 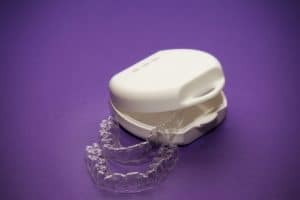 You can also be glad to know that you can remove your Invisalign aligners when you clean your teeth, and when you eat. Straightening your teeth can provide more than just a cosmetic improvement for your smile. You can actually make your bite function better by fixing problems with crooked teeth. This can reduce your risk for suffering from TMJ dysfunction, as you are less likely to put stress on your jaw because of a compromised bite function. You can also have a lower risk for tooth decay, and the need for restorative dental work, when you straighten out overlapping teeth. We can do more than just offer to straighten your teeth if you want to enjoy cosmetic improvements. If you want to make your smile brighter, you can schedule a professional whitening treatment. You can also make improvements to the condition of your teeth by having them covered with porcelain veneers. Veneers are thin shells that are meant to cover the front of teeth. These custom-made restorations hide many different flaws that might leave you feeling uncomfortable with your smile. Minor damages, wear and tear, and naturally occurring issues with the shape of teeth can be corrected by having this procedure done. Michael J. Young, DDS in Lafayette, LA can talk to you about improving your smile with Invisalign aligners! With these modern orthodontic appliances, you can change the way you look when you fix gaps, overlaps, and other concerns over the alignment of your teeth. This is one of many solutions we can offer to your smile concerns. To learn more, contact us today at our Lafayette, LA, dentist’s office at 337-237-6453.